Caption slip reads: "Photographer: Richardson. Date: 1952-10-01. Reporter: Swaim. Assignment: ADW Altadena. 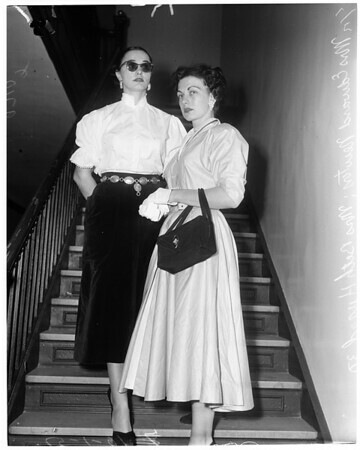 K17: Mrs. Edward Newton (left) and sister, Mrs. Beth Huard, 30. Mrs. Huard had doctor husband arrested for knife threat. Mrs. Newton refused to give age or own first name. K18: Grab shot, Mrs. Beth Huard, 30, left, with baby, George, Jr., 9 months, and Mrs. Edward Newton, sister of Mrs. Huard. If third woman shows in picture it is Mrs. William Orchard, mother of Mrs. Huard".